Bournemouth Borough Council: Pure Town Planning have recently obtained planning permission for the conversion of a former nightclub into two self-contained shops (with flexible consent for Use Class A1 or A2 uses) including alterations to the ground floor elevation including stallrisers, glazing divisions, sufficient space for facias and a clear division between the shops and building above and recessed entrances. As part of the application submission, a Heritage Statement had to be prepared as the site is located in West Cliff and Poole Hill Conservation Area. 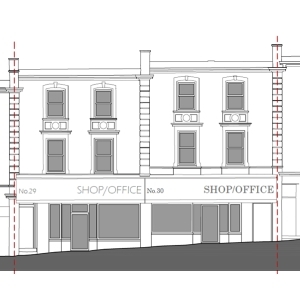 The Heritage Statement set out how the reinstatement of the original shop frontages and the two shop units would represent a significant betterment to this part of the West Cliff and Poole Hill Conservation Area. During the course of the application, the Case Officer only had minor concerns which were quickly managed and the application was subsequently approved much to the delight of the applicant.